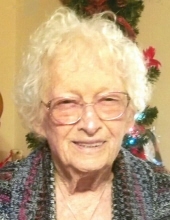 Audrey Agnes Thompson, 91, of Alvin, passed from this life on February 7, 2019. She was born on May 3, 1927 in Hope, Texas to Alexander and Annie (Hander) Doolan. Funeral services will be held 11:00 am Tuesday, February 12, 2019 at Baker Funeral Home in Brazoria with Floyd Scott officiating. Burial will follow at Brazoria Cemetery. Visitation will be held Monday, February 11 2019 from 6:00 pm until 8:00 pm also at the funeral home. Audrey is survived by her sister, Gladys Ruth Marinelli; daughters, Carol Ann Davis, Beverly and Ronnie Delvige, Diane and Ricky Gill, and Delores and Kelly Nolen; grandchildren, James Dwayne Davis and wife, Dianna, Carolyn Ann Ellingson and husband, Roger, Sarah Newby and husband, Chad, Charles Delvige, Jessica Delvige, Amanda Yonts and husband, Randal, Cecelia Sinor and husband, Eric, Russell Parker and wife, Angela, Rhonda Mayers and husband, Brian, Delana, Travis and Ryan Nolen, and Joe Durso and wife, Shana; 17 great-grandchildren; and 9 great-great-grandchildren. She is preceded in death by her husband, Rollins C. Thompson; daughters, Debra Ruth Houston and Gloria Jean Frazer; son, James Edward Frazer, Jr.; granddaughter, Audrey Ann Delvige; and 13 brothers and sisters. To plant a tree in memory of Audrey Agnes Thompson, please visit our Tribute Store. "Email Address" would like to share the life celebration of Audrey Agnes Thompson. Click on the "link" to go to share a favorite memory or leave a condolence message for the family.